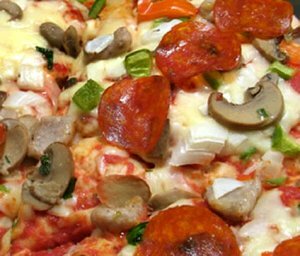 A good Italian turkey sausage and turkey pepperoni is a great tasting and healthy alternative to pork and the flavor combination on this pizza with the sauce and the peppers is just wonderful. Be sure to look for a brand of Italian turkey sausage and turkey pepperoni that contains no pork products. This recipe yields about 8 good slices of about 300 calories per slice (292), a whopping 22 grams of protein, 28.5 grams of carbs, 10 grams of fat and less than half from saturated fat, 4 grams of fiber, and lots of iron and vitamins A and C.
Preheat oven to 450° degrees F.
If you’re using a pan instead of the stone, coat your pan with a light coating of olive oil or olive oil cooking spray. If meat is frozen, thaw slightly. Press whole wheat pizza dough into bottom of pizza or baking pan and press slightly up the sides of the pan. Spread sauce evenly over the dough. Arrange Italian turkey sausage and turkey pepperoni over sauce. Sprinkle with Italian seasoning. Top with bell pepper, mushrooms, garlic, and cheese. Bake for about 15-20 minutes or until the crust is lightly browned on the edges and the cheese is melted. Cool in the pan for about 5 minutes before slicing. Add whatever toppings you love to this classic pie. My family never objects to black olives and rarely has an issue with fresh herbs like parsley.